Brighton defender, Josh Kerr joins Derry City on a six month loan deal from the Premiership club. DERRY CITY has announced the signing of Brighton & Hove Albion defender Josh Kerr on a six month loan deal. The versatile 20 year-old defender becomes Declan Devine's NINTH signing since taking over the Candy Stripes hotseat last November. A former Celtic youth player, Kerr arrives at Brandywell on ex-Hoops' star Paddy McCourt's recommendation. Kerr joined Premiership club, Brighton from Celtic on a two-year contract during the summer of 2017 after spending five years with the Hoops where he won the SFA Youth Cup, beating Rangers 3-0 in the final. He also played in the UEFA Youth League, where he came up against Barcelona and Manchester City. 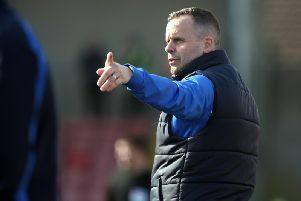 The player has since made numerous appearances in helping the Seagulls win promotion to the top flight of under-23 football in 2018.